(1991) "These Are the Days of Our Lives"
"Bohemian Rhapsody" / "These Are the Days of Our Lives"
"These Are the Days of Our Lives" is a song by the British rock band Queen. Although credited to the whole band, it was largely written by their drummer Roger Taylor, and is the eighth track on the band's 1991 album Innuendo. The song was released as a single in the United States on Freddie Mercury's 45th birthday, 5 September 1991, and as double A-side single in Ireland and the United Kingdom on 9 December, in the wake of Mercury's death, with the Queen track "Bohemian Rhapsody". The double A-side debuted at number one on the UK Singles Chart and remained there for five weeks, topped the Irish Singles Chart for six weeks, and reached number 16 in Germany. "These Are the Days" by itself topped Poland's LP3 chart for fourteen non-consecutive weeks. The song was awarded a Brit Award for British Single of the Year in 1992. The song was first played live on 20 April 1992 at the Freddie Mercury Tribute Concert, sung by George Michael and Lisa Stansfield. This live version was included on the 1993 album Five Live (EP), credited to 'George Michael with Queen & Lisa Stansfield'. The song was played on the 2005/2006 Queen + Paul Rodgers tours with vocals provided by Roger Taylor. On stage the song was accompanied by a video of the band in their early days in Japan, including many shots focusing on past band members Freddie Mercury and John Deacon. The song was used on 1 July 2007 at the Concert for Diana held at the new Wembley Stadium, London in honour of Diana, Princess of Wales, who had died almost 10 years earlier. At the end of the concert, a video montage of Diana as a child was presented and this song was playing in the background. A cover version by Petula Clark is included on her 2008 compilation album Then & Now. The video was the last Queen video to feature Freddie Mercury in person. Rudi Dolezal and Hannes Rossacher of DoRo Productions filmed the footage used in the video on 30 May 1991. Freddie Mercury, Roger Taylor and John Deacon were present at the shoot, Brian May was filmed later in the year and added in digitally, as he was out of the country on a promotional tour at the time of the shoot. Following rumours about Mercury's health, the video was filmed and released in black and white to hide the full extent of his illness. In the video, Mercury wears a waistcoat with pictures of cats that was made for him by Queen Costume Designer, Diana Moseley. With his knowing farewell look straight at the camera, Mercury whispers "I still love you" as the song ends, which are his last ever words on camera. The US version of the video features animation produced by Walt Disney Studios, as Queen's North American record label, Hollywood Records, is a subsidiary of The Walt Disney Company. Another video version was released in 1992 to promote the Classic Queen compilation album in the US, combining old footage of the band from 1973 to 1991 plus the performances of the band from the US aired video. Double A-side with "Bohemian Rhapsody"
^ a b "Remembering Queen's Last Masterpiece, 'Innuendo'". Rolling Stone. Retrieved 18 March 2019. ^ Ewing, Tom (9 March 2012). "George Michael and Queen – Five Live EP". Freaky Trigger. Retrieved 9 August 2017. ^ Elias, Jason. "These Are the Days of Our Lives". Allmusic. Retrieved 18 March 2019. 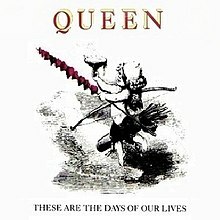 ^ "Ultratop.be – Queen – These Are the Days of Our Lives" (in Dutch). Ultratop 50. ^ "Offiziellecharts.de – Queen – Bohemian Rhapsody / These Are the Days of Our Lives". GfK Entertainment Charts. Retrieved 18 March 2019. ^ "The Irish Charts – Search Results – Bohemian Rhapsody / The Days of Our Lives". Irish Singles Chart. ^ "Notowanie nr518" (in Polish). LP3. 24 January 1992. Retrieved 18 March 2019. ^ "1991 Top 100 Singles". Music Week. London, England: Spotlight Publications. 11 January 1992. p. 20. ^ "Year End Charts: Top Singles". Music Week. 16 January 1993. p. 8. 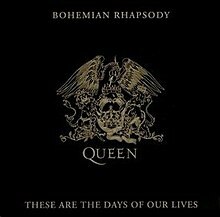 ^ "British single certifications – Bohemian Rhapsody/ These Are the Days". British Phonographic Industry. Select singles in the Format field. Select Platinum in the Certification field. Type Bohemian Rhapsody/ These Are the Days in the "Search BPI Awards" field and then press Enter. This page was last edited on 20 March 2019, at 09:31 (UTC).